Keeping to the limits: Extravagance! 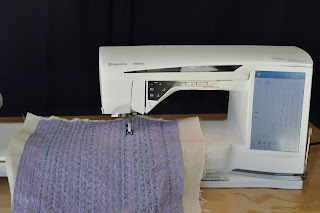 When I took my sewing machine in for repairs on Christmas Eve, I looked at other machines while I was waiting - and started flirting with the idea of buying a new electronic machine (my old one has cogs for the limited range of stitches). After a few weeks of arguing with myself about why I didn't need a new machine, I took the plunge and now own this amazing new Husqvarna Designer Diamond. It seems to be able to do everything except make the tea - and it might even do that. All I've done so far is play around with it. I decided to try all the built-in stitches but gave up after a few dozen (there are hundreds). 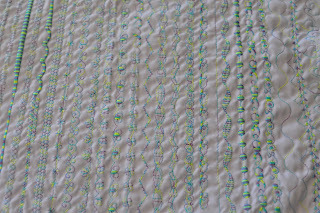 Here's a close-up of some of the built-in stitches. If my work ever gets less busy (I thought I was retired), I'll have fun exploring what it can do. Congratulations on you new machine. Now you can really have fun with all those stitches. I am still working my way through mine and I've had it for over a year. I try to use something different on each project where I want to use automatic patterns. I have to admit to having favourites though!